In the near future, fugitive Chase Sterling evades the transhuman life his creators intended him to lead. He connects with the Underground Church, confident his enhanced strength and intelligence make him the perfect guardian for those forced into a strange and secret existence. His unimpressed bodyguard is out to get him. His affection for a certain young woman may not be mutual. A deceitful recruit accompanies Chase on a rescue mission…with plans to kidnap him. The leader of the underground is dying. The government is closing in. The super powers Chase relies on are switched off by an enemy he thought he’d escaped. It’s enough to make a transhuman give up. Will he find the courage to keep going before all humanity is lost? Life underground mystified the man who used to own the world. Chase leaned against a white partition in the bunker constructed under an abandoned museum. Getting here had consumed his thoughts. Even his dreams. He scanned the sixty-foot-wide room that used to be nothing more than a cavernous hole. Computers and holographic displays filled the space now, along with a group of people all intent on giving God credit for this techno-cave. Odd. Maybe there was a higher power behind it. Something had pressed Chase, caused him to give up everything. Urged him to seek refuge in this strange world. Or maybe it was just his coding, since he’d gotten blown apart and reassembled—turned into a transhuman. Whether Providence or programming, he’d made it. Now he’d do what he came to do: connect these people with others like them around the world. Protect them. Keep them a step ahead of government forces bearing down on them. But somebody had better tell him what all this was about. Why the believers held to their faith. His other reason for coming—to find the truth. But here? Was every branch of the Underground Church literally underground? The middle of the busy command center housed ten computer stations, three to four feet apart. Old-fashioned bulbs hung from the white drop ceiling. In the thirty-eight hours since his arrival, he’d become acquainted with the massive network of information and communication programs. The exoself—the computer built into his very being—now seemed at one with the systems Mel had constructed. No wonder, she’d designed him too. At least in part. She lifted her deep brown eyes and gave him a reassuring smile, then she motioned toward the door to his right. He returned the smile and nodded. Almost time for the meeting. Melody Reese—the third reason he didn’t stop looking until he found this place. He watched her move across the room. Maybe seeing her again had been at the forefront of his reasoning. She’d been the one to organize his days at the Synvue complex, making the coffee and handling the calls. Friendship might have become something more if their lives hadn’t taken such an unbelievable turn. The whole world knew what had happened to Chase, but Mel had harbored secrets. She’d trained in Artificial Intelligence and Chase never knew it. Not until she was gone. After his transformation, they told him that he didn’t need an assistant anymore. Mel was reassigned. Then she disappeared. They’d had little time to talk now that they were back together. She wasn’t the same girl he’d known in Chicago. Black curls, longer than when he’d last seen her, framed her pretty face. The sparkle hadn’t abandoned her eyes. In fact, they had a fire in them now. An urgency. Of course, Chase wasn’t the same either. He took the hallway leading to the rest of the compound. He hadn’t interacted much with these people. They didn’t know what he could do for them. He possessed unlimited intel and processing capabilities—the stuff Mel hid in the exoself. Now he’d upload the programs into this massive computer. When he wasn’t merging the exoself with the systems, he rested. It’d been a while since he had a bed of his own. And he spent some time with the only other resident he knew, his mother. Kim Redding: stellar mom, upstanding citizen. Active member of the underground? Of all people. Mom had accepted the Lord. That’s what she told him. No more surprises could exist in the universe. Was it because of him? Did she need something to cling to when they made her son a transhuman? Transhuman. The term hadn’t caught on, though the movement had started decades ago. Chase was the computer man, a cyborg. A bionic disappointment, as far as he could tell, to the millions who once adored him. He hated the labels. He was just a man. He continued through the complex until he reached the largest of six meeting rooms, where he took his place on a make-shift platform. No amount of paint and silicon could diminish the dank odor of a cave. He forced a breath out his nose and waited for his audience to arrive. Mel said it was time for him to speak to the people. Ninety-seven lived and worked in this branch of the underground. What did they think of him? They shifted in a few at a time and sat in white resin chairs. Not unlike most of the believers Chase had encountered over the last several weeks, they were practiced in unobtrusive charity, offering whatever Chase needed then moving on with little to say. Nobody had time to explain this reckless existence. But it seemed they were anxious to hear his story. Three men dawdled at the back of the room. All the chairs were taken. Chase stepped across the platform. A few people were missing—some mothers and their small children. And his own mother. She stayed in the command center to monitor the computers, which was fine with Chase. He’d already told her everything. Well, almost. Also missing was the cocky guy the group called Switchblade. He’d gone up top in the little town of Herouxville, but the exoself didn’t have access to Switchblade’s agenda. Probably out spying on local officials, making sure they hadn’t noticed the Underground Church had set up operations below the streets of the Quebecian village. The guy had a hero complex. These people didn’t know Chase could wipe out the communication programs of the local police with one carefully directed thought. That would take care of the would-be spy’s high opinion of himself. Chase brought his focus back to the gathering. In the past he’d stood before thousands, while millions watched on GrapheVisions across the continents. Something in his gut grieved the loss of stardom. Maybe Switchblade wasn’t the only one short on humility. He shook off the yearning for his old life and addressed his waiting audience. Laughter rose from the crowd. Chase let the moment pass before continuing. More remarks followed, some too unkind to be directed at an old lady. Whispers carried confusion through the room. The murmuring continued. Chase’s superior hearing picked up every word. “He thinks he’s reborn?” someone whispered. “He doesn’t know his Creator,” another added. These people were ready to toss him out. They have a different understanding of what it means to be reborn. They don’t really go for the whole evolution thing. And God is the only creator. A roomful of eyes stared. Jaws dropped. He waited. If their expressions were an indication, they weren’t convinced. Mel rose from her seat and joined him on the platform. “I told many of you about this already, so don’t look so surprised,” she said. “I know it’s a lot to take in. I designed and installed programs and added them to his processors to give us—the Underground Church—a way to connect all the branches around the world. To help us with supplies and transportation. With protection. Chase is willing to let us utilize these programs, even though I didn’t have his permission for any of this. Everything that was done to him, whether by me or by the scientists who rebuilt him, happened without his knowledge. He lost the life he once had and got transformed into the something he didn’t want to be. People rushed from the room. Frantic voices faded into the hallway. Mel wrapped her hands around Chase’s arm. 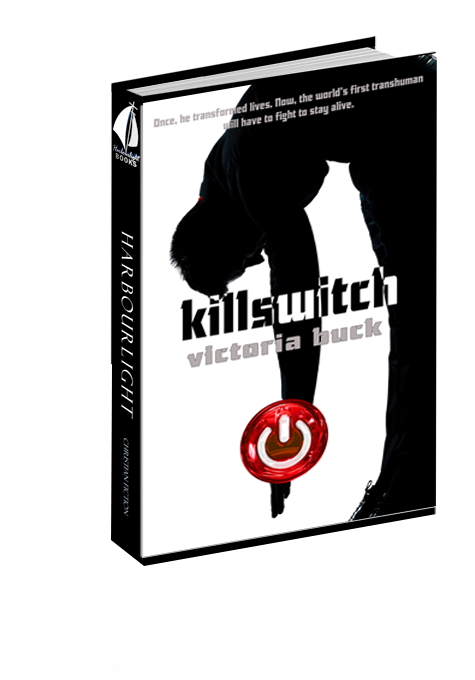 The laughter in Switchblade’s eyes found his lips, which formed into a judgmental smirk before he dashed away.